Reduced to clear! The Alphacool 45 degree angled adaptor can be used to elegantly work around obstacles in your system. 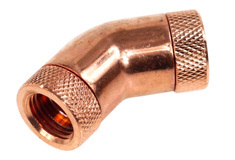 The G1/4in inner threads allow maximum fitting compatibility.